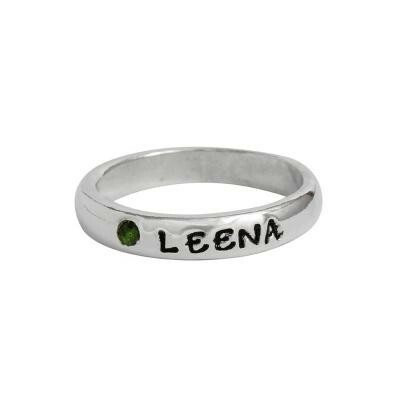 "Stackable Birthstone Name Ring in Silver, Flush Setting, Personalized for one grandchild"
This simple and sophisticated custom ring will become a family heirloom. What a precious way to honor the grandmother of one. Each sterling silver band will have a birthstone followed by a stamped name, a special word, nickname, bible verse or date ~ it's up to you! For the grandmother of one simply put the grandchild's name and birthstone for a meaningful piece of jewelry. Our single rings can be stacked together or worn on either side of an existing ring. Wonderful Mother's Day gift!